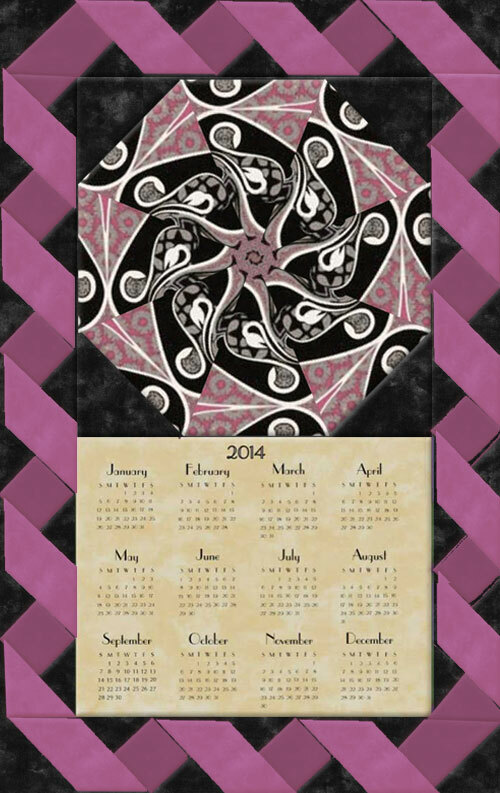 Calypso Swing 2013 Calendar Wall Hanging Kit. Kaleidoscope cut from Calypso Swing designed by Mark Cesarik for Free Spirit. Colors include black, white, gray and fuchsia. The design creates it's own motion and its own mood. It evokes the spirit of music and dance. Pinks, grey and black provide a playful sensibility and enable the viewer to get a sense of direction and purpose. This includes the illustrated instructions to make this Wall Hanging as well as a preprinted 8 1/2 by 6 3/4 inch muslin insert with the calendar printed on it. The finished size of the Wall Hanging is approximately 11 by 17 1/2 inches. Block and 3 fat quarters included.